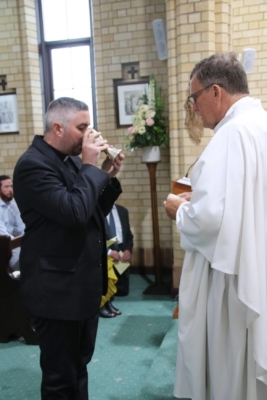 A lawyer by profession, Julian continued along the path to priestly ordination during a well-attended ceremony in Sydney. 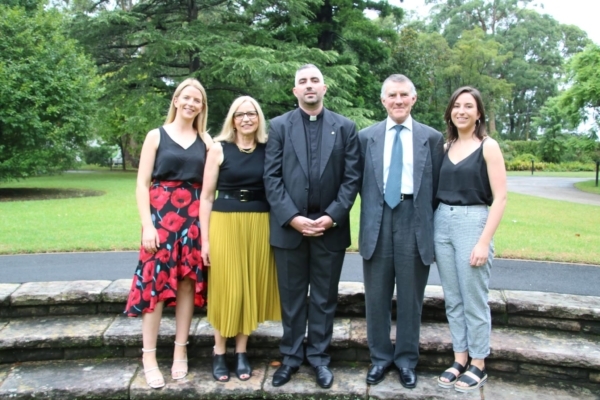 Julian Butler has made his First Vows during a ceremony at St Peter Canisius Chapel, Pymble, NSW, on Saturday 2 February 2019. The vow ceremony was preceded by a prayer vigil for Julian the evening before. Julian takes communion during the Vow Mass. The ceremony was attended by 95 people including Julian’s parents Mark and Anne, his sisters Laura and Siobhan, various Jesuits, and representatives from Holy Family Parish, Mount Druitt (where the novitiate is based) and Kairos, a common formation program for novices from a range of religious congregations. Fr Provincial Brian McCoy SJ presided, Br Ian Cribb SJ, Socius to the Novice Director, presented Julian with the vow cross of Fr Maurie Dullard SJ, missionary to Hazaribag, and Fr Chris Middleton SJ gave the homily. Fr Middleton is Rector of Xavier College, Julian’s Alma Mater. His homily is reproduced below. A lawyer by profession, Julian will continue his studies in Melbourne, before going to Regency, where he will work full time in a Jesuit ministry. He will then complete his theological studies overseas and prepare for priestly ordination. Mary and Joseph were faithful and observant Jews. An important custom was for the couple to take their first-born son to the temple 40 days after his birth to be dedicated to God. The custom provided that if the parents were poor, they were to offer two pigeons or two turtledoves for the sacrifice. And so Joseph and Mary took two turtledoves with them to offer as a sacrifice at the temple. Today’s feast, especially in the East, is sometimes called a feast of meeting, of encounter. The liturgy states that Jesus goes to meet his people. When Mary and Joseph take their child to the temple, it is Jesus’ first encounter with the holy people of God, represented by the elders, Simeon and Anna. It was also an encounter within the sacred history of God’s people. Simeon represents the faithful expectation of Israel for the fulfilment of the ancient promises, and the elderly prophetess Anna, who, on seeing the Child, exults with joy and praises God, represents the fidelity of the people. Jesus is at the centre. It is he who moves everything, who attracts one and all to the temple, the house of his father. In the infancy narratives Jesus is presented to us as the endless surprise of God. In this child, born for all, the past, made of memory and promise, and the future, full of hope and redemption, come together. This is our context as Julian presents himself here this morning to make his vows, in this celebration of his great gift of self. Just as the child Jesus was consecrated, so religious life, articulated in these vows, is a form of consecration, as old-fashioned as the word itself may feel. Consecrated men and women are called first of all to be men and women of encounter and witness. The vocation grows through an encounter that changes our life. One who lives this encounter becomes a witness and it makes them also a promoter of the culture of encounter. Perhaps we have need of that invitation more than ever. Pope Francis speaks of the smell of the sheepfold, and our vows only make sense if they make us of service to God’s people, available, vulnerable and faithful. There is profound challenge here — for many the Church has become remote and irrelevant; for others its failures or contradictions as an institution, especially around sexual abuse, has made us a sign of contradiction. There is also division and polarisation, with many of God’s people, and her ministers, confused, fearful and uncertain. Ignatian spirituality takes seriously our context and reflection on it, and surely this is never more important than now. Julian’s vows are hope-filled — they offer nurturing, healing, redeeming words to us and to all we serve. The vows are extraordinary in what they affirm, just as the marriage vows are. They are not signs of status or entitlement but rather are commitments of mission and love. The vow of obedience, for instance, is a commitment to go wherever you are sent. The vow of chastity is a commitment to radical availability, and the vow of poverty is a commitment to freedom in service. Julian (centre) with his family after the ceremony. Today’s vows are not a one-off. They have to be remade every day. Some days, most days, Julian won’t even notice. But there’ll be some when he will have to sit down and pray because the cost of the gift will just have registered in a new and unexpected way. The vows then are an act of trust in God’s Spirit. There must be a smile to the vows, a sense of joy and generosity that comes with being led by the Spirit, never rigid, never closed, always open to the voice of God who speaks, who opens, who guides, who invites us to go towards the horizon. At the heart of what we celebrate today is gift, God’s gift to us and the gift that Julian is drawn to respond to in his life. Julian intuits with delight and joy that God is asking of him the costly gift of himself, and there are real costs, but he knows that God has already shown himself to be the very best of gift-givers. In a real and personal way, Jesus Christ gave himself for Julian’s sake and Julian knows that to be the case and takes up his discipleship. Already as a lawyer and in the Xavier Social Justice Network Julian has been advocate for those in need. As a Jesuit novice he has spent many months allowing himself to be moved and stirred by the love of Christ; and he has seen the love of Christ in the people whom he has served, especially the poor, the vulnerable, those on the margins, the excluded and the suffering. And the result, as you see today, is that he wants to kneel before the Lord and offers himself in return. Saint Ignatius authored that powerful prayer which is in many ways the heart of his Spiritual Exercises. Its final sentence captures the very heart of all this: ‘You have given all to me; now I return it.’ It’s not a heroic self-immolation that is going on here but a circle of gift, a mutual self-giving. It is fundamentally relational in nature as Julian grows in his companionship with the Lord. The Gospel ends with this expression: ‘And the child grew and became strong, filled with wisdom; and the favour of God was upon him.’ This was surely Julian’s experience with his family. May the Lord Jesus, through the intercession of Mary, continue to grow in Julian and in all of us, and increase in each the desire of encounter, the call to witness and the joy of gratitude; then others will be attracted by His light, and will be able to encounter the love of God.